A handicap allows golfers of varying skill levels to compete on a fair and level playing field. A golf handicap is a standard barometer used to compare golfers with different levels of skill. Calculating, understanding and implementing this figure for use in competition can be accomplished by any golfer. The U.S. Golf Association defines handicap as a "mark that indicates the number of handicap strokes a player receives from a specific set of tees at the course being played to adjust the player's scoring ability to the level of scratch or zero-handicap golf." Course rating and slope rating are vital when defining and calculating a handicap. Course rating indicates the difficulty of a golf course to a scratch golfer under normal weather and course conditions. For instance, if par for a course is 72, a course rating might be 71.6, as course ratings typically are expressed with a decimal point. Slope rating conveys the difficulty of a golf course to a "bogey golfer," one who routinely shoots 18 over par for an 18-hole round. This number is always a two- or three-digit figure, ranging from 55 to 155, with 113 as the average. Among the most important ways a handicap serves golfers is by allowing them to tangibly measure the improvement in skill level. For instance, a golfer with a 20 handicap who over time drops to a 12 handicap has a measurable improvement of eight strokes per round. The handicap also gives a golfer a target for continued improvement. 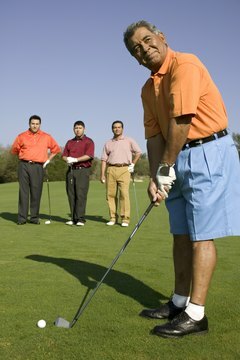 A handicap often is used in scramble format play and in friendly golf outings. In the two-man scramble format, frequently used for corporate and charity events, players deduct their handicap from their final score in registering a team "scramble score" for competition purposes. In a friendly golf outing, a handicap allows players of varying skill level to compete against one another equitably by adding the number of handicap strokes to the stronger player's score or deducting the strokes from the weaker player's score. To record an official handicap, input the dates and scores of each round, along with the course rating and slope rating for each course played, into a free online handicap calculator, which is widely available. Keep in mind, however, that for a handicap to become official a minimum five rounds must be registered.